Latest model, he said. A real throwback. A muscle car for the new millennium. Gotta love the ‘Stang, he said, winking and sweating, eyes roving. I needed a shower. He was no Rutger Hauer. Artwork licensed under the Creative Commons Attribution-ShareAlike 3.0 license. See the image’s home page for details. I’m spending my week off fighting traffic jams, three tightly compacted lanes each morning. I bought the convertible special for this week — traded in the Taurus for a shiny Mustang — and I’ve got the top down. A sparkly red car. The kind of car Rutger will notice. 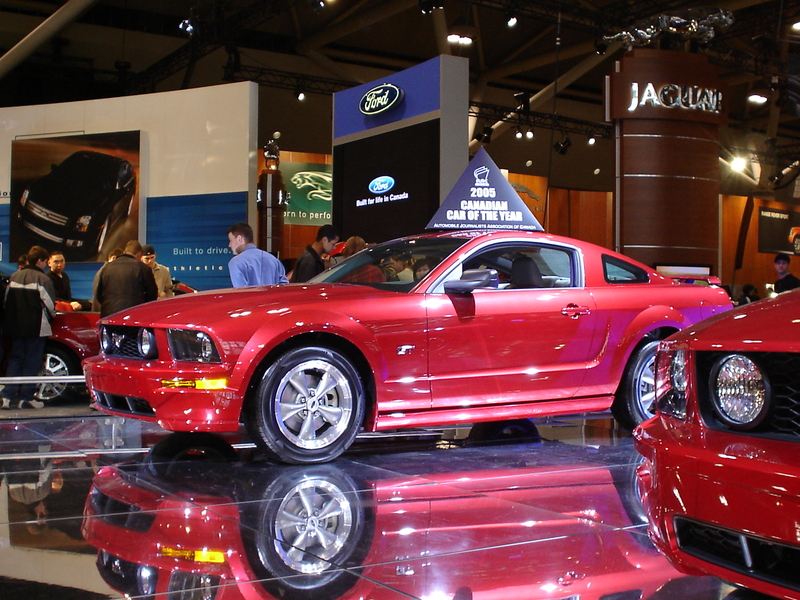 The car salesman — a short, pudgy, greasy cliché of a man — kept talking about the ‘Stang. Latest model, he said. A real throwback. A muscle car for the new millennium. Gotta love the ‘Stang, he said, winking and sweating, eyes roving. I needed a shower. Rutger rides the freeway every morning, like me. Imagine! Rutger Hauer. Ordinary, everyday person. I like that about him. He’s one of us. And I like his white-blonde hair and his blue, blue eyes. Oh, those eyes. I’ve seen Rutger every weekday for the past few months, always a few cars ahead, top down — yeah, top down — his crop of blond-white hair blowing in the smog-choked breeze. I’ve left earlier trying to time it so he’ll be closer to me, perhaps beside me, all to no avail. He’s always up ahead, out of reach. Like everything in my life. But I’ve got a ‘Stang, now. What I wouldn’t give for a quick glimpse of his strong, fallible face. I wonder if he’s moved here. Probably in town filming. I see the sleek dark-tinted limousines cruising the roads like silent sharks, transporting Brangelina, TomKat, and Charlize. Hiding in their air-conditioned world. But not Rutger. No. He isn’t too good for us. He isn’t too good for me and my shiny red car. 7:52 a.m., I’ve left the onramp and I’m heading south. Traffic stalls, stops. Three lanes coiling like snakes in search of prey. I maneuver into the middle lane. This is a better vantage point. You never know where he’ll be. But I don’t see Rutger. Not yet. Don’t see his car. It’s black and sporty and European. Refined. Like him. To my left there's a silver Audi. Shirt-and-tie guy. Shirt-and-tie guy turns, lifts his sunglasses, blinks. Staring and blinking from shirt-and-tie guy. “Your favorite Rutger role?” I repeat. Shirt-and-tie guy pulls his sunglasses down, turns, and moves forward a car length. Hmmph! Not a fan. Way too serious. Action, thriller type guy. Thought he might have seen The Osterman Weekend. Ludlum and Peckinpah, with Rutger starring. What’s not to love? A little orange Honda with dark windows pulls into the spot vacated by the Audi. A mechanical ladybug. Can’t see inside. Heavy thump of a bass track booms from the little capsule. Probably too young. Might have seen Sin City, though. Not a starring role, I know. But good. So good. To my right is a squat motorcycle, a blue and chrome bullet. Blue and chrome helmet. Blue and chrome eyes? Maybe. Hard to tell from here. Black leather. Long hair. Blue and chrome kid stares, bewildered, revs his engine. A shrug of the shoulders. Shrill blare of a horn. I start, shake my head. Sheesh! Drifted off there. Another horn blast. Behind me a green Hummer like a bloated bullfrog. Driver frantic, waving. Traffic rolls ahead. Inching around the bend. I move forward, take up the space, stop. Tiny gray Hyundai rolls up. Rusted wheel wells. Frigging Hyundai. Cute blonde, though. Sharp nose. Thin mouth. Bangs across forehead. Michelle Pfeiffer. A dead ringer. Michelle wouldn’t be caught dead in a piece of crap Hyundai, though. Ladyhawke. Michelle opposite Rutger. Gorgeous. They don’t make them like that anymore. Around the bend now. Slow. Stop. And... there he is! Rutger! To the right, a dozen cars ahead. Top down. Yeah, top down. That’s my boy. Thick white hair blowing in the wind. Arm resting on the door. Casual. Cool. Nothing. He can’t hear me. His lane creeps ahead. A foot. Two. I smack the horn again, but the middle lane isn’t moving. The left lane nudges forward, then the right, Rutger’s lane, gains another few feet. I wave again. Yell. Still nothing. He can’t see me. So I place the car in “park” and I stand. More waving. More yelling. More nothing. The other two lanes advance, edge forward. I’m stuck in the middle. Damn. He’s getting away. I hop out of the car, and sprint up the expressway. I imagine I’m Roy Batty from Blade Runner, Rutger’s finest hour. Horns squawk. Traffic moves. My heart hops and the scent of hot tar assaults me. I swerve between cars, hands bracing hoods for support. The vehicles speed up. Rutger is a few scant car-lengths ahead, but his sporty black convertible accelerates, merges with the suddenly free-flowing traffic. No! “Rutger. Don’t!” But it’s too late. He’s lost. I almost had him, and now he’s gone. It’s the closest I’ve gotten, though. And there’ll be another chance. After all, I have the whole week off. More if I want. I’ve been thinking I need a change. I turn and start walking back to my car, straddling two lanes. Cars move by in a dizzying blur and a symphony of horns. 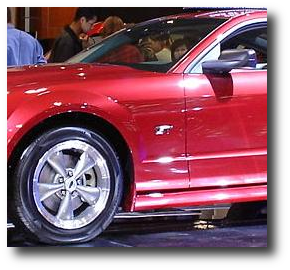 I climb into the ‘Stang, but my hand hovers hesitantly over the gear shift. I keep the car in “park” and turn on the radio. Screw ‘em. This time I’ll wait. I’ve got plenty of time. Who’s that behind me? Is it...? Could it be? The star of Spaceballs and Independence Day? One of the most underappreciated actors of our generation? I squint into the rearview. I turn, stand on the car seat, peer at the driver. Michael is an editor at The Toronto Star and a contributing editor at City Slab. His fiction has appeared widely in journals and magazines, including All Hallows, Carleton Arts Review, The Literary Journal, Lone Star Stories, and Plum Ruby Review. His story, The Kraken (link in PDF), has been nominated for a British Fantasy Award. Recent work can be found online in Nossa Morte and Reflection’s Edge. In 2007 a collection of his short stories, Scratching the Surface, was published. Forthcoming soon is a novel, Ouroboros (co-written with Carol Weekes). He is currently editing an anthology of ghost stories, Apparitions. When not writing, editing, or dreaming, Michael likes hot food, cold beer, and playing electric guitar with heavy distortion. Copyright © 2008, Michael Kelly. All Rights Reserved.